I have already written to Michael Gove, who did to his credit reply and pass my story to IDS. The outcome of this intervention was the cessation, after many years, of my pursuit for repayment of benefits I was actually entitled to. After countless calls and letters, one sensible administrator took the executive decision, and cancelled the demand for repayment. Setting aside the stress, mental torment and anguish I was already going through as my child was slipping away through a series of corrupt manoeuvres on the part of her father and his enamoured and deluded new partner. Girls…take it with a pinch (or a sack) of salt eh? If your new partner makes a lot of noise about how ‘mental’ their ex was…just think. It is natural for some insecure individuals to foster security by assuring their new love interest there is no love lost between them and the predecessor. Please ask questions and talk among yourselves. I have accepted we are unlikely to achieve anything in terms of recompense, or even apology. This is merely catharsis, and a form of legal protection because, as you know, I ‘ain’t got no lawyer. I just have stubborn old me. My response to Surrey council Carers survey..couldn’t resist! I am a parent carer, Action for carers recently provided an excellent signposting service but in fact I found our family was ineligible for the majority of services, and my enquiries often met with pure confusion. I was unable to register for the emergency scheme. I registered as a carer with my GP but it has not been noted and I still have to fight to have my own health fully monitored despite having a chronic fatigue problem after caring and working full time for so long. Social care, when asked to do a carer assessment decided to opt for putting my daughter on a child protection plan instead and has publicly defamed me in the process. I have thereby lost substantial earnings, become unwell with stress and exhaustion, and as a result missed the opportunity to progress to the next stage of my career. I would love to talk to someone about the extent of the tax-payer funded problems Surrey has caused us, and the appalling lack of genuine support for tax paying single parents. I have worked in Camberley for five years as an orthodontic nurse in a busy NHS subcontracted practice. The education system had failed my daughter, she has ADHD and has been largely excluded from formal education since Summer 2012. The statutory assessment process was completed in October and yet she is still stuck at home and getting into more trouble while losing all her academic confidence. She was measured and found to be gifted in literacy and numeracy. 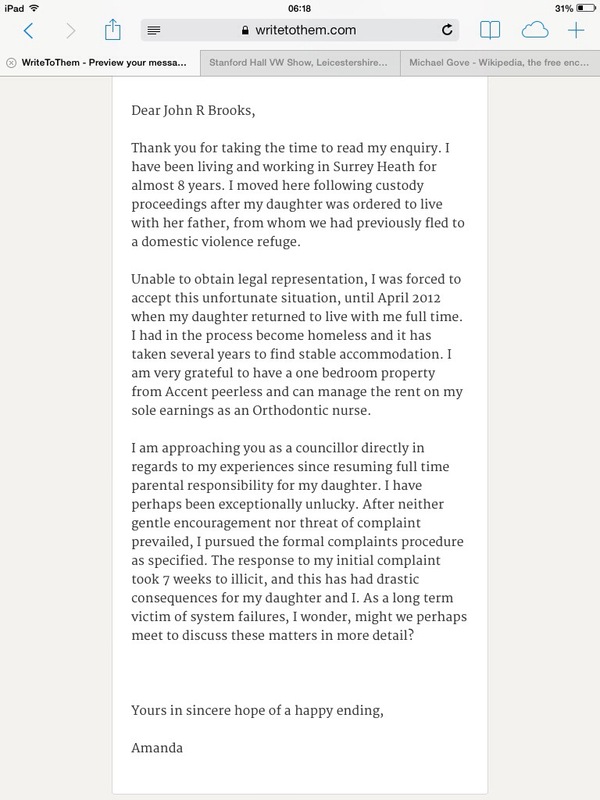 I must insist you pass this information on as I have had no adequate response to my formal complaint raised in December 2013 and resupplied 2 weeks ago via the family feedback email. I have given adequate opportunity for redress and explanation. I think it may be time to see what the wider world thinks about our fate at the hands of the state?